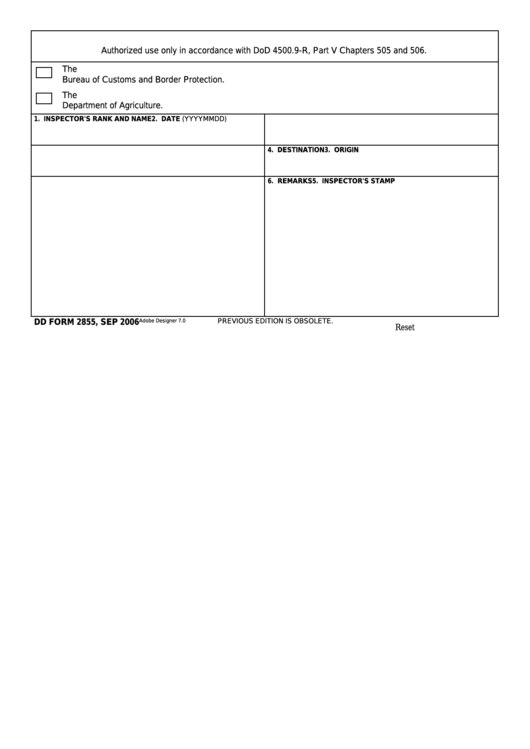 Download a blank fillable Dd Form 2855 - U.s. Military Agriculture And Customs Preclearance Program in PDF format just by clicking the "DOWNLOAD PDF" button. Complete Dd Form 2855 - U.s. Military Agriculture And Customs Preclearance Program with your personal data - all interactive fields are highlighted in places where you should type, access drop-down lists or select multiple-choice options. Authorized use only in accordance with DoD 4500.9-R, Part V Chapters 505 and 506. The U.S. Government property to which this label has been affixed meets the entry requirements of the U.S.